When I was at school one of my favourite subjects was history. I was particularly obsessed with ancient history – the empires of Rome, of Athens, the myths and legends of the Mediterranean world. 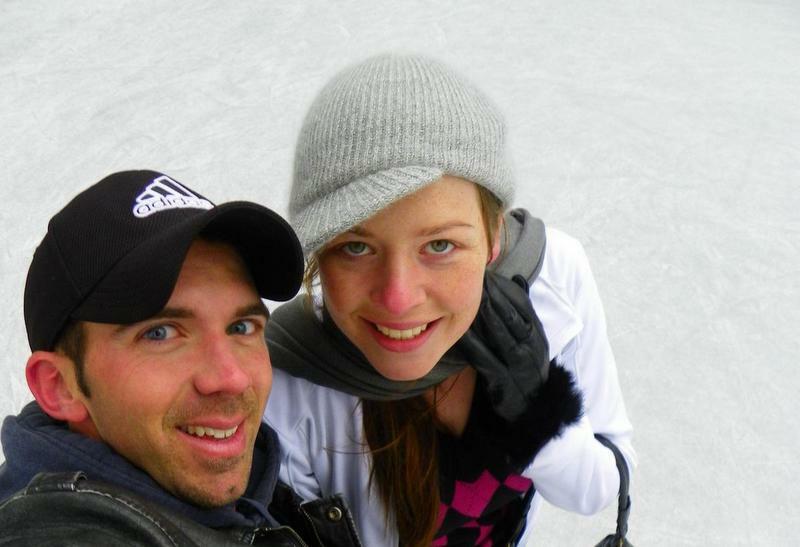 Looking back, this enduring passion for history was triggered by a family holiday to Rome. My parents had a real knack for planning family holidays that were subconsciously educational – taking us to places that had some key points of interest and historical importance and letting us discover and explore, patiently answering our numerous questions and pointing us in the right direction to find more information. Using that model of educational travel, the spectacular ruins of the Colosseum in Rome is an amazing way to open the eyes and the mind of any child to the wonders of the ancient world. The Colosseum is without doubt one of the greatest works of Roman architecture and engineering, and the answer to everyone questioning what to visit in Rome. Its construction dates back to the year 70 AD when the emperor Vespasian ruled Rome. With the capacity to hold up to 80,000 spectators, this amphitheatre was the centre for major entertainment spectacles – not just the battles between gladiators that we normally associate with this time, but also mock sea battles, animal hunts, public executions, re-enactments of historical events or military victories, or plays and dramas bringing to life the myths and legends of Rome. The Colosseum was used in this way right through until the sixth century after which it fell into disrepair following earthquakes and fires – its decline mirroring the fall of the Roman Empire. It’s a little ironic that it was the Catholic Church that saved the Colosseum from complete destruction. This arena where early Christians had been martyred and executed for public entertainment was declared a sacred site by Pope Benedict XIV in 1749, sanctified by the blood of the early Christians that had been killed there. The church initiated numerous restoration and stabilisation projects, reinforcing the surviving facade and beginning the excavation of the arena’s substructure. 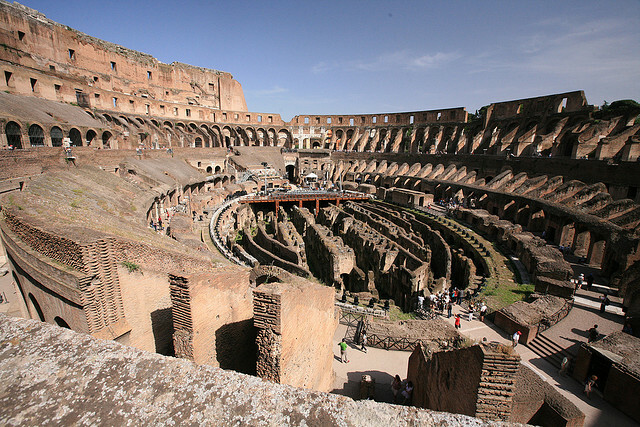 While you can explore the site on your own, a Colosseum tour is the best way to really get a feel for how this arena operated and what it can tell us about the workings of the Roman Empire. The Colosseum was built by the best craftsmen available, tackling with ingenuity many of the challenges that modern stadiums are still grappling with – ground level entrances and a ticketing system was used to get the crowds in and out quickly, and a retractable awning provided shelter from the weather and also helped to create a breeze. But it is the floor of the arena that is really fascinating – the arena had a wooden floor and beneath that a two-level underground network of tunnels and cages where gladiators and animals were held waiting for their turn in front of the crowd. Vertical shafts and large hinged platforms could be used to change scenery or release animals as large as elephants. As a young child, it is exhilarating to be able to stand in the ruins of the Colosseum, to close your eyes and imagine the sights and sounds of Ancient Rome, the gladiators, the battles, the heat, and the crowds. This is how you learn about history. Rome is a really special city, most definitely one of my faves if not my favourite at night. 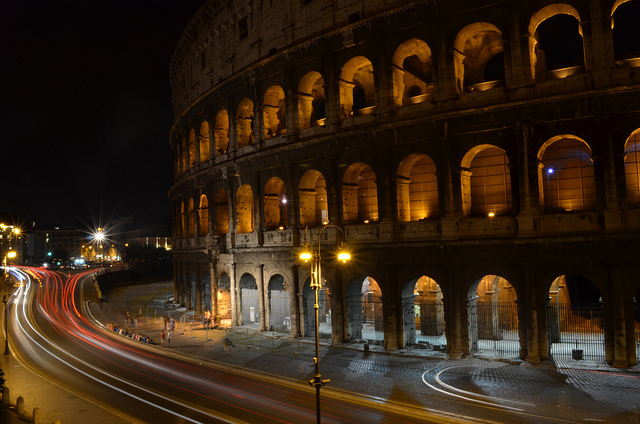 Totally agree with you – you truly can’t beat the Colosseum at night! The atmosphere around Rome is eletric once the sun sets! This landmark always fascinated me. 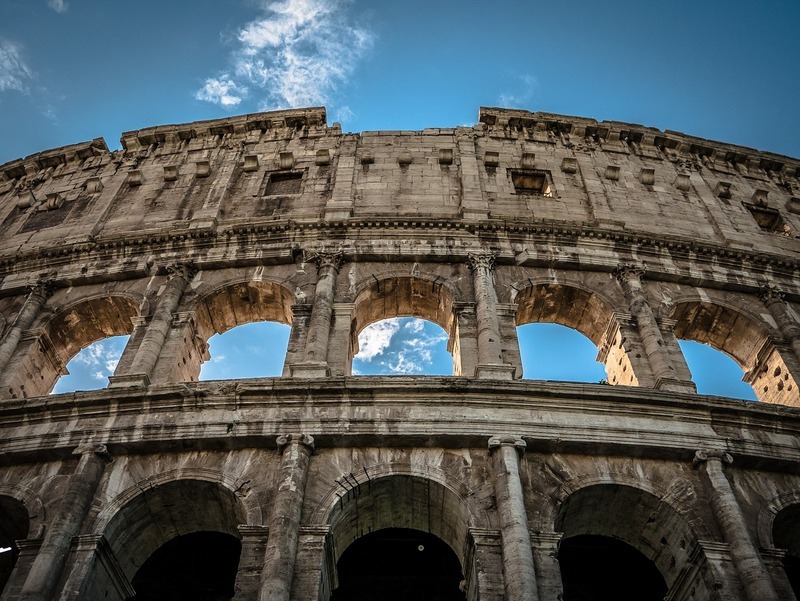 From my history lessons, to movies – especially Gladiator – to the unbelievably brutal things that went on inside the Colosseum, Rome and this iconic site is 1 of a kind. So much history in such a spot, and to think this stuff actually went on is insane. Being an animal lover this one makes me shudder, but I read one particular emperor who was a skilled archer would practice shooting the heads off of ostriches. Horrific, but still, to even try to comprehend the brutality of these folks, isn’t possible for me. Feeding Christians to lions, and fighting animals to the death, yet they were so far advanced in so many ways and sped up civilization’s growth. From orgies, to the vomitorium, to the Colosseum and its brutality, yet Rome was the most advanced, dominant empire in its day. Amazing paradox. Thanks Meg! Tweeting from Fiji. It truly is an amazing paradox – as you said, they truly were so advanced for their time, yet so horribly vicious in what they saw as entertainment. It was definitely humbling being in such an iconic place knowing the horrific history behind it, but at the same time acknowledging that it is a tremendous landmark which also marks the height of one of the greatest civilizations we’ve known. History fascinates me, so I love incorporating it into my travels! So glad you enjoyed the post!